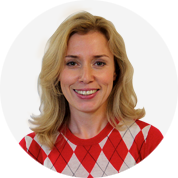 Olga works tirelessly - often behind the scenes - to ensure projects run smoothly, risks are anticipated and mitigated, and clients feel that their projects are in safe hands! She drives rigour in all aspects of our business and regularly stress-tests our documentation and project controls. It’s because of her that we are an efficient, well-run agency. Her background in IT project management and business analysis means she also works client-facing as a Project Manager and gets closely involved in discovery phases.